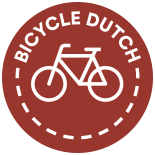 “The Dutch make over 1 million cycle trips every hour”. All the latest (2011) figures of the Dutch Cyclist’s Union in one video. These figures show that the scale of cycling in the Netherlands is quite phenomenal. The Netherlands has a population of 16.7 million people and the Dutch cycle a lot. There is more cycling in the summer than in the autumn and winter. But on an average working day, 5 million people make an average of over 14 million cycle journeys. car owners and those without. 13.5 million Dutch people have one bike, or more. The total number of bikes is estimated to be 18 million. natives far more than immigrants. more than a million cycle journeys are made every hour. The high point is between 8 and 9 in the morning with 1.75 million cycle journeys. In that hour, many people cycle to work and school. on the streets of the Netherlands than there are cars. By 9 most adults are at work, college students are now on the way. The counter jumps to 2.5 Million journeys. Before midday another 2.5 million cycle journeys will be made for a variety of reasons. Bringing the total to 5 Million. Between 12 and 1 there are 1.5 million more rides. cycle home for lunch and back to school again. The total is now 6.5 Million. At 2 the counter shows 7.7 million. Another 1.2 million cycle trips passed in the early afternoon. At 4 most children have left school, and they cycle to friends, sports-clubs etc. In the last two hours, 2.5 million cycle journeys were made. Bringing the total to 10 Million. 1.2 million cycle journeys pass in the late afternoon. and school children head home from sports clubs. At 5 the evening rush hour is about to start with already 11.2 Million trips counted. When the clock strikes 6 most of the Dutch are home. Another 1.2 million cycle journeys have passed. The total is now 12.4 Million. In the six hours of the evening another 1.75 million cycle journeys are made. and people go out on the town by bike. that over 14 Million journeys were made by 5 million people on their bicycles. When people cycle in the Netherlands they arrive at their destination 5% faster than drivers. In larger cities this is more than 10% faster. For trips under 3 kilometers the bicycle almost always wins. An average bike ride is a little over 3 km and takes just about 15 minutes. 75% of all bike rides is less than 4 km. But doesn’t it rain too often to cycle? According to the Dutch weather bureau, it only rains 6.5% of the time. Of course, the longer you’re outside the more likely you’ll get wet from the rain. from 0.09 in May to 0.16 in December. The bicycle is a safe means of transport. in the Netherlands, is the lowest in the world. and the large number of people on bicycles. This entry was posted on 17 February 2011 by Bicycle Dutch in Video post and tagged Cyclists' Union (Fietsersbond), figures, watching people cycling.